Ever had Booza before? that stretchy and chewy Lebanese ice cream. This Arabic take on ice cream is full of intense flavors that will take you on a lifetime journey. Try this homemade Sahlab mix for a drink with closer taste. 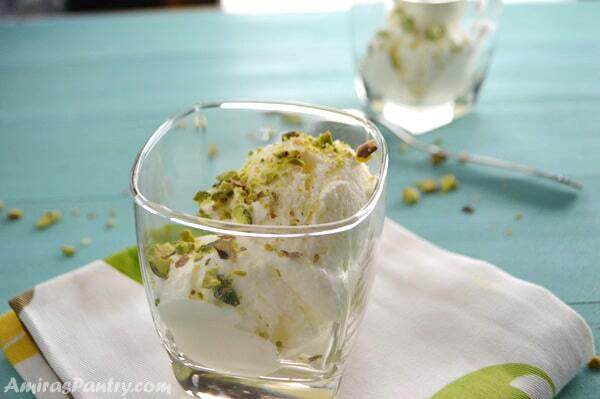 Get ready for a taste of sensation, Lebanese ice cream is heavenly good. 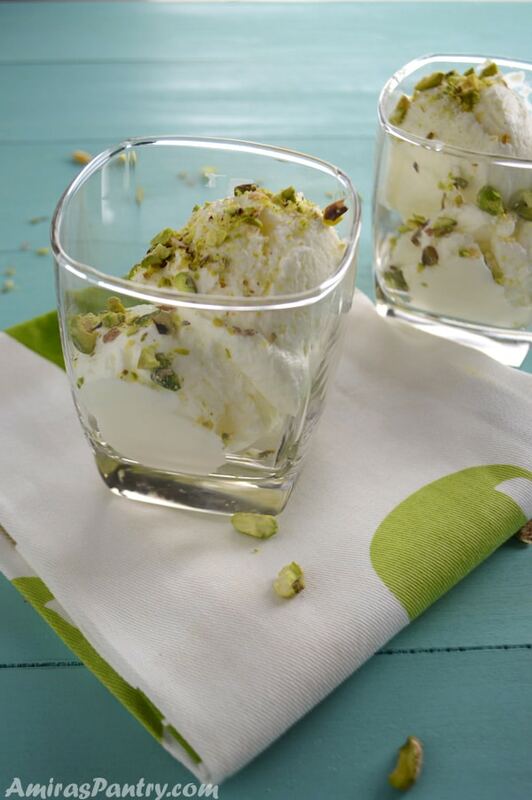 It is made with Ashta and mastic gum add pistachios to this combination and you are up for a feast in your mouth. 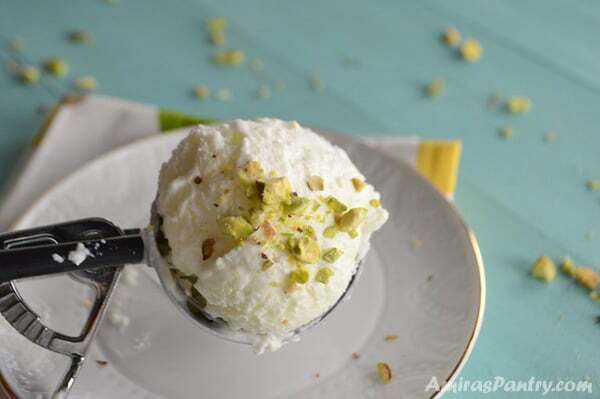 Lebanese ice cream is called Booza or Buzza and sometimes it is referred to as Arabic ice cream. Booza is filled with Middle Eastern aromas. Unfortunately, I could not get a hold of it here in Colorado, so I rolled my sleeves up and started experimenting with different recipes and here I am with – the closest in flavor and easiest for you to make- a homemade Booza recipe. I’ve had my first Booza long time ago when I was in high school, we were on a trip to Alexandria in hot summer days, and I fell in love ever since :). When I am in Egypt, I always go to this famous ice cream shop there and almost always get a huge cone of Booza and mango Gelato. These are my two favorite ice cream flavors. 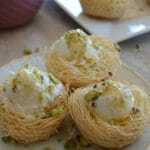 Ashta is clotted cream usually flavored with rose water or orange blossom water. You’ve seen me prepare Ashta is many recipes before. 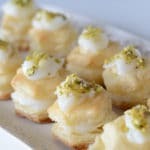 There are many ways to prepare Ashta, you can take a look at this cream filled Arabic pancakes ( Qatayef Asafiri) or here in Ma’amoneya or in making these Phyllo cream stuffed fingers. Why is Turkish ice cream stretchy? I’ve known this sort of ice cream for my whole life as Lebanese. But Google has another opinion, some refer to it as being Turkish. Anyways, this sort of ice cream is know to be stretchy and chewy, why? because Salep is used to give it that stretch. How do you make Sahlab? Well Sahlab powder that you see in the market to make the drink is another story. It does not contain the original Salep flower hence it will not give you the stretch that we are looking for. If you are interested in making the Sahlab powder itself here is my homemade version of Egyptian Sahlab. So all recipes that you’ll find online use either cornstarch or the store bought Sahlab powder, just know that it will not be that stretchy. Unfortunately, Salep is very rare and impossible to find. I’ve regretted not going to the spice market during our visit to Turkey and searching for that magical powder. It is now considered an endangered flower due to excessive harvesting hence forbidden to sell outside Turkey. If you can get it, that would be great. Please email me or leave a comment below and tell me where did you get it from. 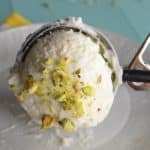 How to make Lebanese Booza ice cream? I’ve chosen the easiest recipe possible and with ingredients you can easily get. 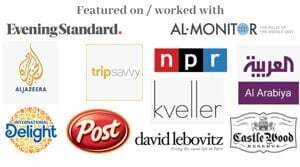 You might not have mastic though, but it is very easy to find online, Natural Groceries (I’ve seen it before in Vitamin Cottage) or in the International market in your area. I need to tell you though that this recipe does not yield a stretchy ice cream because I did not have Salep. If you are one lucky person who have it, I will provide you with a how to add at the end of the recipe. In a pot add, cold milk, cornstarch, sugar and salt. Mix very well until sugar and cornstarch are dissolved. If you have Salep, this is when you add it, simply add 2 teaspoon of salep powder instead of cornstarch. You can also use store bought Salep powder instead of cornstarch 1:1 ration. Turn on heat on medium and cook the mixture, stirring every now and then until thickened and bubbly. Mix in the ground mastic. Turn heat off, cover and let it cool completely. You might want to cover the surface of the cream with plastic wrap to prevent skin from forming. Beat the whipping cream, until it reaches stiff peak. Add the cooled Ashta and beat well until it comes to a smooth consistency. Mix in chopped pistachios if you would like or wait until you serve it and sprinkle with pistachios. Pour into a freezer friendly container, cover and freeze. Serve topped with more pistachios or plain. I’ve made Booza and it was creamy and so nice the first day, after a couple of days it started getting harder so here is what I did, I let it out for 45 minutes until it melted a little and mixed it in the container with my hand mixer, then back to the freezer for another hour and here it came out smooth and creamy again. This recipe yields a 56Fl Oz or equal to 7 cups of Booza, hence it can be a luscious dessert for you and some guests coming over. 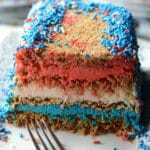 But if you are making this for only you and your little family, I suggest cutting it in half so it will not stay in the freezer for long. Making it and enjoying it freshly is the best. Originally, you should add pistachios to the booza before freezing, but I served pistachios upon request because some of my kids do not like nuts. So for allergy purposes you can serve it on the side or leaving it out completely, you’ll still get the unique taste for booza. 1 cup sugar- or to taste. 1/4 teaspoon ground mastic gum. 2 cup heavy whipping cream. Put the pot on medium heat, keep stirring until it starts to bubble. Add the mastic powder, keep stirring, until it gets thick and creamy. Turn off the heat, cover and let it cool down until it reaches room temperature. 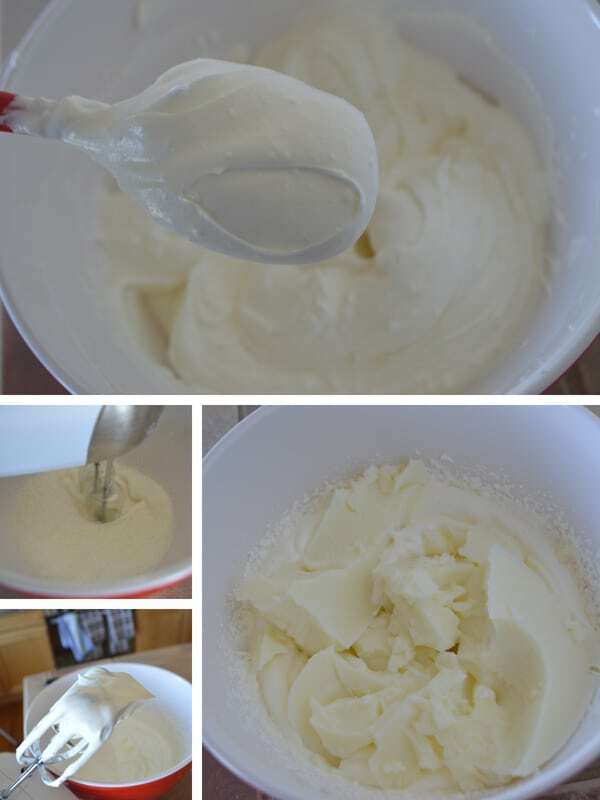 Add the cornstarch mixture to the whipping cream, beat together until it comes to a smooth consistency. You can add pistachios at this point or wait until serving time. Pour into a freezer safe container, smooth top and freeze for 8 hour or until it is completely frozen. 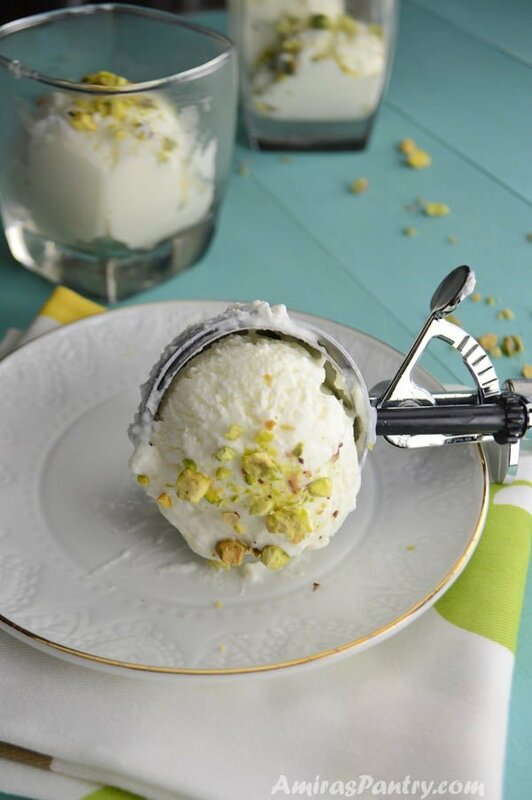 *Scoop in ice cream bowls, sprinkle top with some more pistachios. 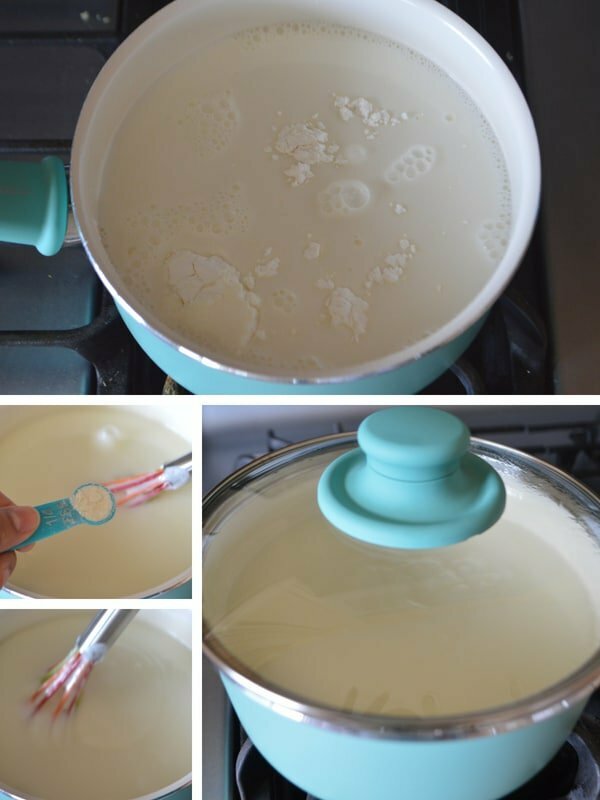 * Sometimes it gets harder in a couple of days, if this happens take it out for 45 minutes on the counter top, then beat with your hand mixer in the same freezer bowl, put it back in the freezer for an hour, it will come to a creamy texture again. ** Some People also add orange blossom and or rose water for more flavors. oh my . Its so hard to find mistic in my country. Can replace it with anythings ? Nina, can you shop online? or do you have a MiddleEastern store in your region? These are the two places I would search for first. 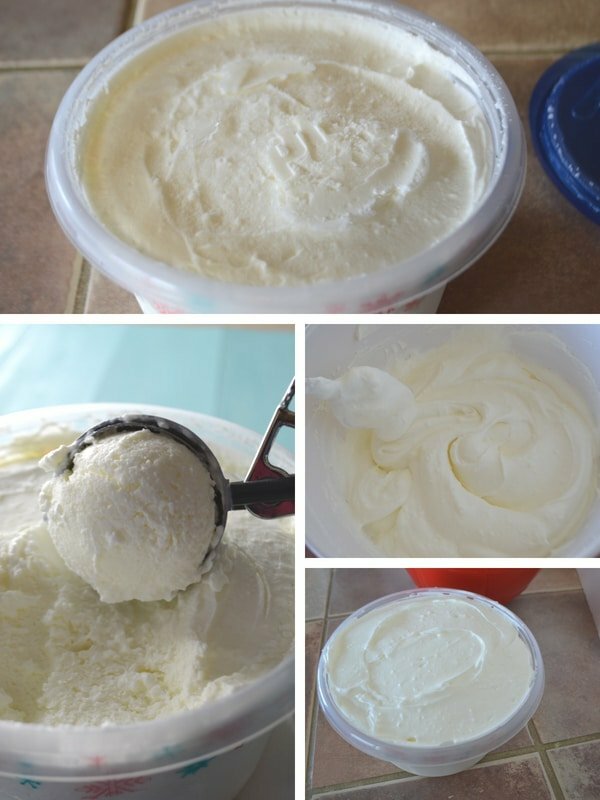 If you make it without the mastic, it will be closer to a vanilla ice cream.